LLS Community : A Vaccine to Treat Mantle Cell Lymphoma? 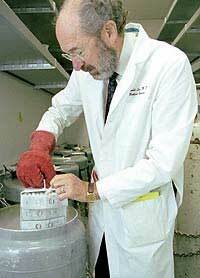 Ronald Levy, professor of medicine and former chief of the Division of Oncology at Stanford University School of Medicine, helped develop and test the first US Food and Drug Administration (FDA)-approved monoclonal antibody against cancer for the treatment of B-cell lymphoma. Rituximab is now a standard of treatment alone and also in combination with chemotherapy regimens. s high-dose chemotherapy followed by stem cell transplant, which eliminates most of the lymphoma, but temporarily wipes out a patient’s immune system. Residual lymphoma cells often remain and cause the disease to recur within a few years. Levy aims to show that vaccinating a person with their own altered cancer cells can incite a powerful immune response against the disease that eliminates those residual cells. Phase II clinical trials are ongoing and have shown promise. How would you explain your research and why it has such promise? Our research looks at how the immune system can be harnessed to fight lymphoma. With this project, we are making a personalized vaccine from each patient’s lymphoma cells and we hope that when we add it to the current treatments it will keep the disease from coming back. You’ve already had success in using the body’s own immune system to target B cells by using antibodies that bind to cancer cell receptors. What made you think a vaccine would be a logical next step? We have had good results in a preclinical animal model that shows how a vaccine made from the tumor cells can give rise to T cells that can cure lymphoma when transferred to a stem cell recipient. At what point in their treatment do patients get this vaccine and how does it work? We obtain tumor cells from patients with mantle cell lymphoma, either from their blood or from a lymph node, before they receive any therapy. The tumor cells are then activated by exposure to a toll-like receptor ligand (TLR ligand), which causes them to elevate their expression of molecules involved in stimulating T cells. The tumor cells are then radiated so they cannot multiply and stored in the freezer. This is what we use for the vaccine. The patients are then induced into remission with Rituxan and chemotherapy. Once the patients are in remission, they receive the vaccine and the T cells are collected from their blood. The patients then undergo a standard autologous stem cell transplant, which is part of the usual treatment for mantle cell lymphoma. The patients then receive the T cells that we collected along with booster vaccines. What is the theory behind giving the vaccine after the transplant? We are training the immune system to kill any lymphoma cells that remain after the transplant. What have the clinical trial results showed so far? We have a test that can find very rare tumor cells in the blood. After the regular treatment, 40 percent of patients still retain some of those cells. The use of our vaccination reduced that number to 15 percent. When will we know if this will become an option for other patients? Ultimately, this will require a randomized trial where some patients get the vaccine and some do not and the outcomes are compared. Clinical trials still have to be conducted and any approvals could be years away. What other studies are you doing to understand the anti-lymphoma response especially regarding correlative studies/biomarkers/ immune response, etc? We are measuring the immune response in the patients against their own tumor cells after the vaccination and after the booster vaccines. We are also measuring their blood for tumor cells by a sensitive molecular test. Read Q&A's with other LLS-funded researchers here.